Nashville, TN…Lyric Street recording artist Aaron Tippin recently spent some time in South Dakota to shoot an episode for Great American Country’s (GAC) new show, "Made In America". The show brings viewers up close and personal with the companies and monuments that make America what it is today. As the host of the show, Tippin travels across the United States to visit some of America’s most well known landmarks, bringing viewers up close and personal with the history and the people who make it all happen. Tippin started his day in South Dakota in Black Hills, visiting Mount Rushmore with author and historian, Tom Griffith as his tour guide. Tippin had the opportunity to meet Nick Clifford who was the youngest sculptor to work on carving the faces on Mount Rushmore. "An interesting fact about Nick Clifford,” Tippin noted, “is that he was hired to help sculpt Mount Rushmore simply because he was a good baseball player!" After the majesty of Mount Rushmore, it was off to Hot Springs to participate in an actual archeological dig for dinosaur bones with archaeologist Larry Agenbroad. 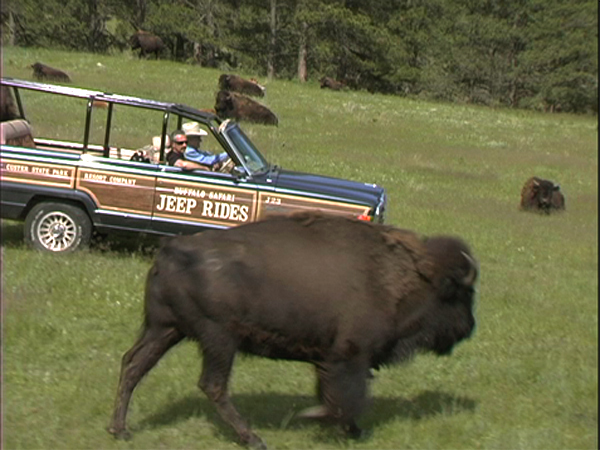 Later, Tippin toured a buffalo ranch at Custer State Park where he experienced riding out into a herd of buffalo. "You can't roller skate into a herd of buffalo,” joked Tippin, “but you can ride a Jeep into one." 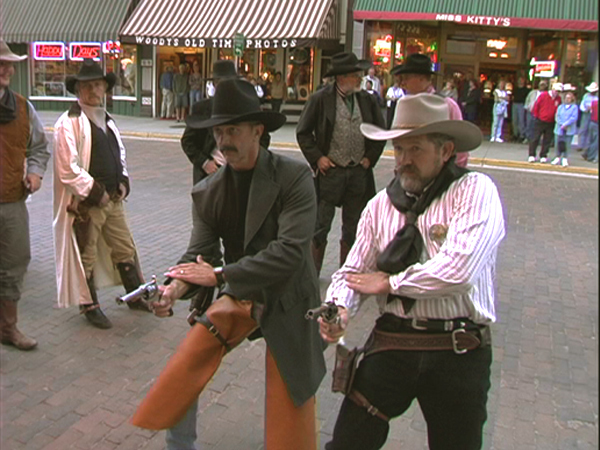 After spending some time at the ranch, it was on to Deadwood to meet trick shooter, Brad Hemmah. 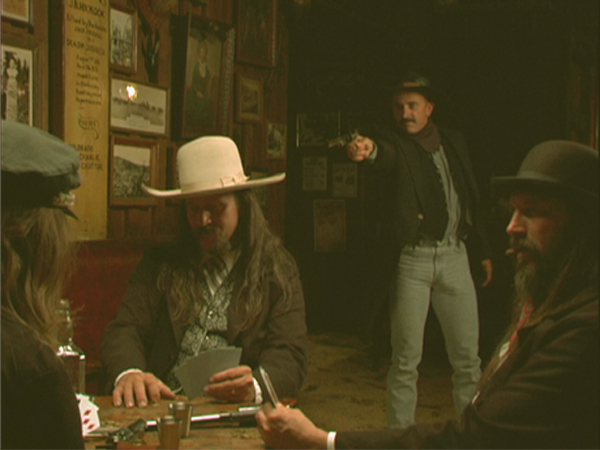 Hemmah, the former world quick draw champion taught Tippin some moves which came in handy when he reenacted the famous shooting of Wild Bill Hickock. "Boy I never knew there was so much to do in South Dakota,” said Tippin who really enjoyed his visit. “What a fun place!" You can see Aaron’s visit to South Dakota on this weeks episode of “Made In America” on GAC. Visit www.countrystars.com/MadeInAmerica.html for a schedule of the "Made In America" series. 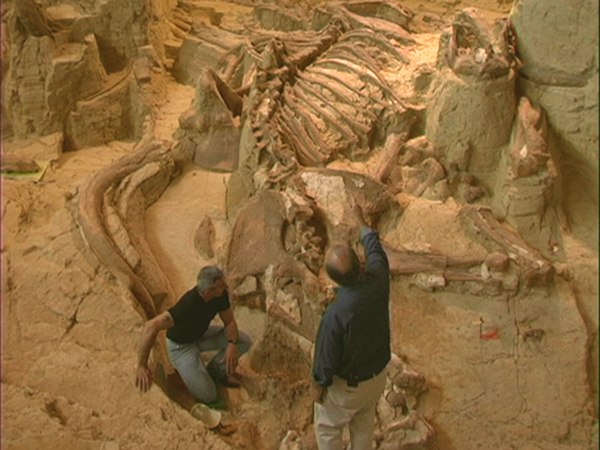 Aaron helping archaeologist Larry Agenbroad dig for bones from a wooly mammoth in Hot Springs, SD. Aaron riding out into a herd of buffalo. Brad Hemmah showing Aaron how the fast draw is done. After Aaron did the fast draw, he was told that he did well enough to compete with fast draw professionals. Aaron got to reenact the shooting of Wild Bill Hickock, where he played Jack McCall. Copyright ©1998-2003, Aaron Tippin Fan Club.